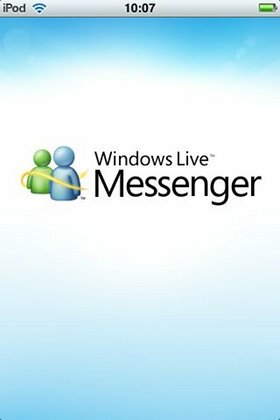 Not too long ago, Windows Live Messenger was the pinnacle of online communication. Every man and his dog were available on the online service, and you’d seldom come across someone without a Hotmail account. This was, of course, prior to the days of mainstream social networks. When MySpace, Facebook and Twitter came along, MSN Messenger was left in the dark. However, with a recent re-launch of the Live Messenger platform, Microsoft has attempted to include social aspects for users including status updates and online photo albums. It may still have a way to go until it’s as popular as a service such as Facebook again, but there have definitely been significant advancements in the past 12 months. Naturally, it is, therefore, a logical step forward for Microsoft to release an iPhone application, allowing users to stay online on the go with instant messaging, as well as access to Hotmail inboxes too. After the launch of Bing on the iPhone (but annoyingly not for us in the UK), it came as less of a surprise to see Live Messenger appearing on the App Store, but how does it stack up against the mass of competition in the market? Pretty well, it seems! When taking a look at the iPhone Messenger application for the first time, it seemed extremely well designed and easy to get around. The interface is split up into four main tabs: Social, Friends, Chats and Photos. The Social section of the Messenger application focuses on something I mentioned earlier: competing with services such as Facebook and allowing users to “share something new” on their status. If you want to update your status, you can tap on the text field at the top of the screen, which expands and allows you to type easily. Again, the design of this section is extremely professional and well developed, so kudos to Microsoft for that. 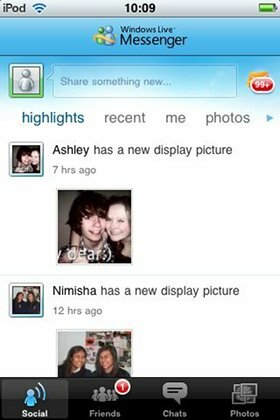 When viewing the status’ of your friends, you can flick between various options above your feed, which allows you to choose between highlights, recent, photos and status messages. The Friends section of the application acts as a contact list, displaying all of your contacts like you’d see on the desktop version of Messenger. They’re all organised into categories you’ve decided upon when using the desktop application, so everything is where it should be! 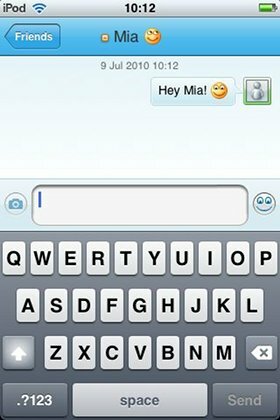 You can simply tap on a contact to open a chat window with them and start composing a message. All of your chats that are currently open are viewable in the Chats section of the app. Again, just tap on a chat to open it back to full screen again. In the Photos section, you can manage all of the albums that you’ve uploaded on your Messenger account. I found albums that I’d uploaded years ago and completely forgotten about, so if you’ve not used the service for a while it may prove to be quite interesting! You can upload photos straight from your iPhone or iPod Touch (or iPad) when using the app, which is a nice feature to have too. If you talk to people using Microsoft Live Messenger, it’s definitely a great free iPhone application to grab from the App Store. I found it to be incredibly well designed, and one of the best instant messaging apps available for iPhone. It’s a free download, so go check it out!